➣ By Andrea Gaggioli et al. Figure 1: Group therapy in a MMOG. Telehealth is the use of telecommunications services to deliver healthcare-related services and information, including (but not limited to) consultation, assessment, intervention, and follow-up programs to ensure maintenance of treatment effects. In past decades, the increasing diffusion of the Internet and related online tools has opened up a blend of possibilities for this approach. Medical professionals can now communicate with patients utilizing chat, e-mail and videoconference systems, in addition to telephones. In this way, doctors can reach isolated and marginalized people such as rural, prison and military populations, as well as patients who are unable to travel due to transportation difficulties, cost or disabilities. Telehealth can help to maintain the primary care provider-patient relationship, while at the same time reducing overall costs by monitoring patients daily and preventing them from requiring emergency care and expensive re-hospitalizations. Thanks to these benefits, telehealth is rapidly becoming one of the most important ITC healthcare markets. According to a recent forecast by independent analyst Datamonitor, the global market for remote access health systems is growing rapidly and will exceed US$8 billion by 2012. One of the most promising field of telehealth is telepsychology, the provision of psychological services in a technologyassisted environment. The advantages of this approach are similar to those offered by telehealth–patients can have direct and immediate access to geographically remote professionals and expertise, with the possibility for consistent and continuous care. A specific benefit provided by telepsychology is that clients can feel less inhibited, which foster further emotional involvement and disclosure. Individual therapy and online self-help groups are the most widespread applications of telepsychology. The first refers to the provision of individual therapy and consultation over the Internet. Online self-help groups refer to bulletin boards, chat rooms, news and discussion groups operated within heal th- related Web pages, listservs (groups in which each individual message is copied and sent to all subscribers), and other electronic forums focused on the sharing and solving of psychological disturbances. The core principle of the on-line self-help groups approach is the sharing of experiences, strengths and hopes between members in order to solve their common problem. Even if the available data about telepsychology programs are encouraging, this approach poses new and important challenges with respect to the anomalies of “being present” and able to meet other presences in virtual space, but with no physical body. Facial expressions, movements, tone of voice, and body gestures are commonly used by therapists to better understand the psychological status of patients and by patients to trust to the therapist, but they are at least partially missed during telehealth sessions. As a consequence, misunderstandings between a therapist and patients may arise due to the lack of these non-verbal clues. Moreover, telehealth applications do not allow multiple users to share the same mediated communication environment, that is, from a clinical point of view, the main characteristic of group therapy or self-help groups. Figure 2: The creation of an Avatar. The Brain Talk Industries have created a number of online communities and forums to support people affected by specific physical and mental disabilities. An example is the Brigadoon, a private island created in Second Life specifically designed for patients with Asperger’s Syndrome, a form of Autism characterized by enormous difficulties in social interactions. Brigadoon is meant to serve as an ideal place for these patients to develop social abilities and interactions with other people dealing with the same problems. A similar aim has guided the creation of Live2Give, another place in Second Life dedicated to people affected by cerebral palsy. Like Brigadoon, this virtual world brings people together giving them the possibilities to help each other in their similar struggles. Similarly, a British organization called ARCI has developed a virtual environment in Second Life to help abused children learn important life skills. They enter the virtual world to learn to socialize, work as a team, and learn essential computer skills. The success of these virtual communities proves the potentiality of MMOGs in becoming very useful tools for an innovative form of telehealth. In addition to these existing mental health programs, we can envision a possible therapeutic application scenario of MMOGs consisting of group therapy sessions performed in private areas. After a number of face-to-face sessions in which the therapist meets the patient in order to make a diagnosis and to analyze his or her needs, the therapist can decide if the patient is suitable for on-line group therapy. If this is the case, the patient will receive instructions on how to enter into the virtual space with a personal identification code. In order to guarantee privacy, only persons with a personal code will be admitted to the therapy rooms. Different therapy rooms will be created on the basis of the needs of different categories of patients and the access will be restricted only to those patients with a specific diagnosis. Various environments can be created for each category of patients, such as, for example, learning areas, discussion areas and experienceoriented areas. Learning areas use motivation provided by the virtual worlds to teach the users how to manage the critical aspects of their experience through slides and film presentation, both with and without teachers (Figure 1). Discussion areas allow patients to talk about their problems and share experiences with others, with or without the supervision of an expert (see Figure 2). Finally, experience-oriented areas will serve to practice both emotional and relational reactions, using the feeling of presence provided by the virtual experience, as well as general decision-making and problem-solving skills through the presentation of critical situations related to the different pathologies (Figure 3). Free access to an electronic library with books on specific arguments will also be provided for subjects in order to extend their theoretical knowledge at any time. The main advantage of this MMOGs-based therapeutic scenario is to provide patients with live meaningful experiences instead of just theoretical information in a virtual environment in which they have the possibility to meet other users, socialize, participate in group activities and practice new abilities. 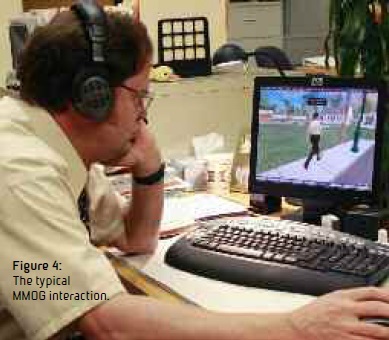 Since MMOGs are closed worlds that do not reflect the real status of the users, during their presence in the virtual worlds patients could be instructed to use various bio and activity sensors in order to obtain realtime monitoring of their health status and f e e d b a c k that can influence their own experience. At the same time, the use of biosensors allows the therapist to monitor, at distance, the outcome of the virtual experience. This approach–usually defined “interreality” and actually explored by the European funded project “Interstress” (http://www.interstress. eu)–can provide the following advantages– the outcome obtained from the virtual experience can be transferred to the real world and vice versa and the social links created in the virtual environments can be continued in the real world, even without revealing the user’s identity (for example, by using SMS or e-mail to communicate or ask support from a virtual friend). Although the therapeutic possibilities of online games are quite promising, the problems that could arise with such a kind of therapy should not be overlooked. In fact, if it is true that people can explore threatening aspects of reality in a “safe” environment, it also true that if the use of MMOGs becomes excessive, it could present a risk of preventing people from forming meaningful relationships in the real world. 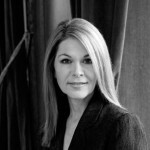 As observed by Dr. Sara E. Allison, M.D., from the Menninger Department of Psychiatry and Behavioral Sciences, Baylor College of Medicine in Houston, TX, an “increased substitution of cyberspace-based personas and relationships at the expense of face-to-face interaction may create a developmental double-edged sword. The Internet may provide a socially -anxious patient the opportunity for modified peer group interactions, yet it does little to foster the development of genuine intimacy.” When exposing patients to virtual environments, therapists should consider the risk of game addiction and also encourage their patients to participate in real life social interaction as much as possible. Regarding therapists, as for any other type of domain of practice, it is very important that they first conduct a self-assessment and then enhance their knowledge and skills in using these alternative forms of therapy, since the provision of telehealth services is not simply a click of the mouse nor is it fraught with pitfalls and malpractice suits. Most MMOGs have open access, meaning that it may be difficult to create safe therapeutic environments in which patients can interact with therapists without external interferences and with privacy protection. In sum, the possibilities of using MMOGs as an advanced form of telehealth are quite promising as long as their limitations and dangers are taken into consideration as well. Further research is needed in order to understand the real added value of this emerging technology.